Texas Rangers Cards: Walking the Plank. I know, this isn't Thursday and I don't normally post two game-used or autographed cards in a row. 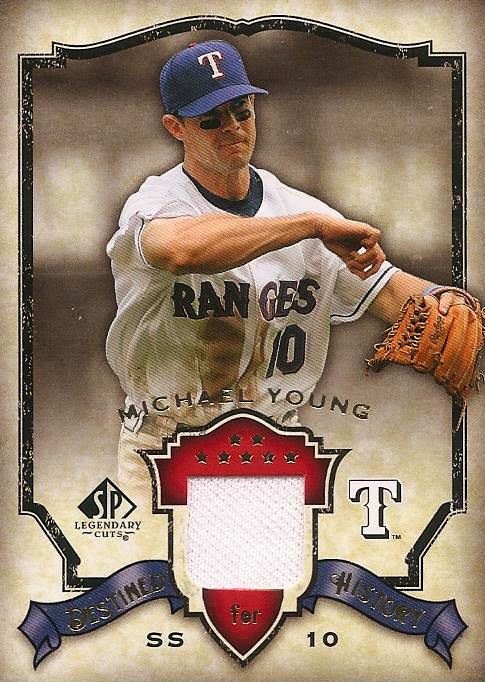 The reason for me posting this 2008 SP Legendary Cuts Destined for History card of Michael Young isn't a normal reason though. A couple of weeks back I was trolling through the various blogs linked from some of my regular reading. I came across Bob Walk the Plank. BWP is a great Pirates-oriented blog. I left a comment asking the owner, Matt, to send me his address so I could drop some random Pirates cards on him. One of the reasons I don't buy a lot of packs is the lack of space to store the non-Rangers teams. I have to keep the other clubs down to a manageable level. Several teams have a bad habit of building up (looking at you Giants) and the Buccos were one of these teams. Any time I can find a good home for the non-Rangers cards I have built up I consider it a win-win. Somebody gets cards of their team and I get that much closer to an excuse to buy some packs. I dumped a small lot of random Pirates on Matt and cheered the new space. I was sure to tell Matt he did not need to return anything. Matt's definition of not returning anything was a small bubble mailer that arrived in my mailbox within days of him receiving the cards I sent. Inside was this Michael Young along with two more Young game-used, a Hank Blalock game-used, and a Matt Harrison certified autograph. Wow and wow again. There's no way what I sent Matt called for anything close to what he sent in return. Thanks a ton for your generosity Matt, hopefully I can return it someday. Looking forward to more trades. Let me know if you find more Pirates and I'll ship some Rangers your way.